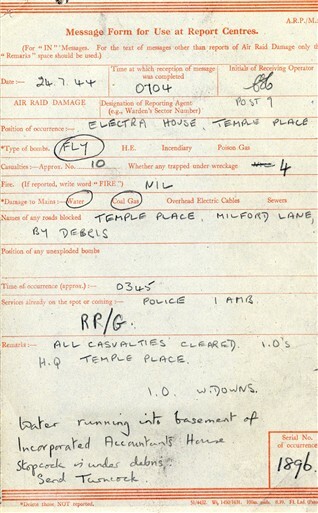 At 3.40am on 24 July 1944 a V1 flying bomb tore through Temple Place WC2, close to the Victoria Embankment and Temple Underground Station. 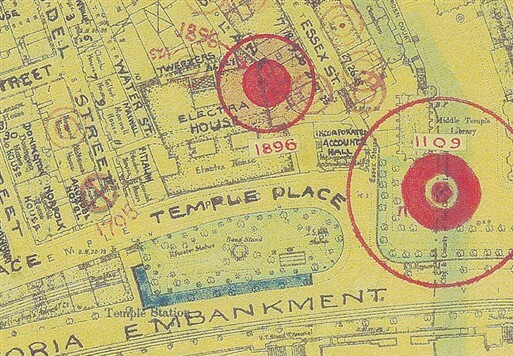 This area of London had been badly damaged on 8 December 1940 when a parachute mine hit Temple Gardens and wrecked the Middle Temple Library. 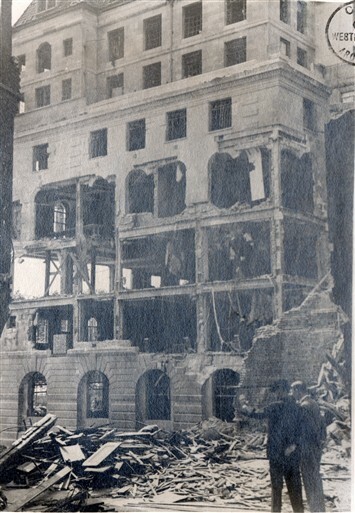 On 24 July the V1 destroyed part of Electra House (1929), Head Office of Cable & Wireless Ltd, at which were based both the company's main operating circuits and offices for support staff. These departments were initially separate entities, with only the operating staff occupying Electra House. 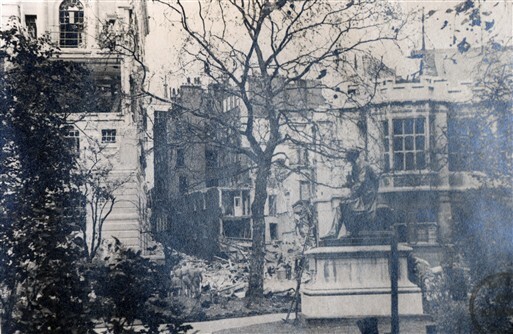 However, after incendiaries damaged Electra House in Moorgate in May 1941, the two sections had relocated together to the Embankment. 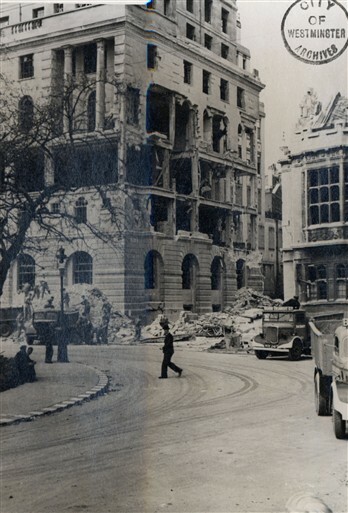 On 24 July, the flying bomb hit the east wall, destroying the Chairman’s apartment as well as the Accounts Department. The blast killed three members of staff and injured 17 others. 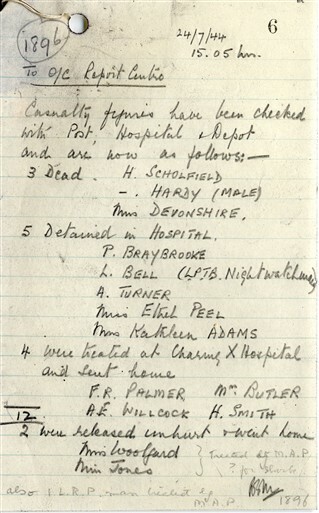 Several of the wounded were subsequently detained in Charing Cross Hospital. Hours after the incident, Cable & Wireless confirmed that all communications were in working order, despite the heavy damage to the building. 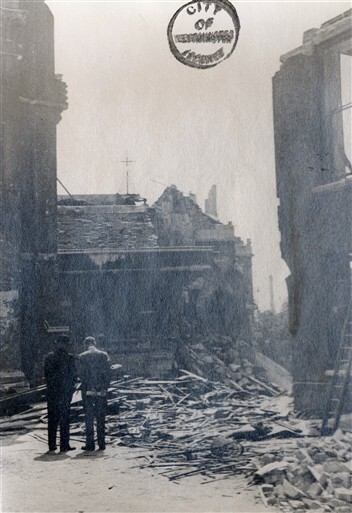 The massive explosion and resulting debris blocked Milford Lane and Temple Place. Several other individuals were trapped at 28 Essex Street. Thankfully, Heavy Rescue crews managed to rescue all of them. 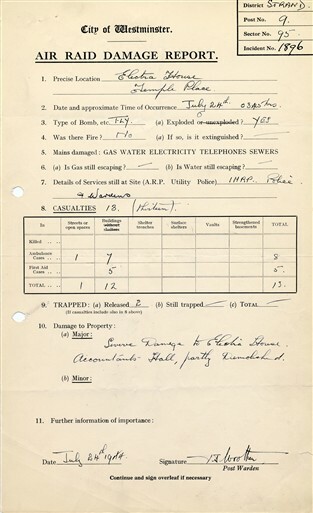 During the rescue efforts at Electra House it was discovered that water was flowing into the basement of Incorporated Accountants House (Astor House) next door. To make matters even worse, the stopcock lay under the debris. Astor House's basement, built for the financier William Waldorf Astor in 1895 by architect John Loughborough Pearson, contained priceless works of art by William Silver Frith (since lost). Eventually, the flooding was stemmed by utility crews and Astor House survived. The ruins of Electra House were redeveloped after the war and later used as offices by accountants Arthur Andersen (during the 1990s). In 1999 the site was rebuilt again as Globe House, headquarters of British American Tobacco, 4 Temple Place. Astor House was also restored, renamed Two Temple Place and is now protected by the Bulldog Trust. Visitors can see the fantastic original white marble fireplace that managed to survive that brutal July morning. This page was added by Sarah Boyle on 27/07/2011. Last paragraph states that 'Electra House was redeveloped after the war as Globe House' This is incorrect. 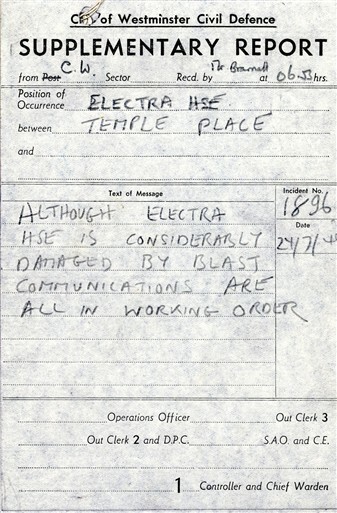 The building was repaired and kept the name Electra House until demolition in 1999. A new building was built in its place and named Globe House. I believe the 'Hardy' casualty mentioned is Charles Hardy of Beeston, Notts who was my great uncle.